The Sneaky Fantasy Basketball Pickups for Tuesday, December 10 is 2013 Dunk Contest Champ Terrence Ross. He’s owned in 2% of Yahoo! Leagues and 0.6% of ESPN Leagues, and his first start of the season last night didn’t do anything to move that meter. Yet it’s the very fact that he started that should pique interests. There’s not much to look at here. Ross’s shooting was miserable, as were his turnover though those are abnormal, as he’s averaged only 1.4 in his career even in per-36 min numbers. His FG% is better than that, but not by much (40.6% career). The four threes were nice, but what was even nicer were the 38 minutes. As I mentioned two days ago, the Raptors took Ross with the eighth pick in the draft last year (one pick ahead of Andre Drummond – oof, but two ahead of Austin Rivers – phew), so they’ll want to see what they have with him. However, he was a product of the Bryan Colangelo era, so new wunderkind GM Masai Ujiri has no feelings of responsibility to keep him. Still, Rudy Gay’s departure means Ross is going to get to play. Landry Fields does not seem to be in favor, and John Salmons should not play a major factor for a team clearly looking to rebuild, despite sitting atop the Titanic Division not too long ago. If he’s proves his value, you’ll have a promising young SG/SF looking at 30-35 mpg. If he continues playing like he did last night, release him back onto the waiver wire and take a good look at Salmons. Other Notable Players: Raymond Felton is back, so Tim Hardaway Jr. is done for now (Update: Actually, it turns out he tweaked his hamstring injury and could now be out for a while. Timmy is interesting again! )…The last three Knicks games have all been blowouts in one direction or the other, so, in a surprising development, Amar’e Stoudemire has actually been getting some run. He is owned by the 39% of Yahoo! fantasy owners who still believe it’s 2010, but, with the injuries to Tyson Chandler and Kenyon Martin, Stoudemire might be worth something if his own injuries let him stay on the court long enough…Jarrett Jack put up about the emptiest line you can have (17-0-1-0-0, 3 3pm, 2 TO), but he has averaged 13.3 pts, 4.0 reb, 2.3 ast and 2.0 3pm in his last three. While he’s not reliable yet, he has been cutting into Dion Waiter’s productivity lately. The Waiters trade rumors subsided after he was excellent a week ago, but if he is still on the block and gets moved, pick up Jack immediately…The Spurs have one of the deepest rotations in the league, and Marco Belinelli had to be near perfect just to put up what he did (4-for-5 FG, 2-for-2 FT). Still, 12.6 pts, 2.3 reb, 2.4 ast, 1.0 stl, 2.3 3pm on 59.4% FG over his last eight…Been watching Kentavious Caldwell-Pope for a while because he’s young, talented and gets a lot of minutes for the Pistons. Don’t read too much into what he did in last night’s blowout, but keep KCP on your watch list for when Detroit falls out of the playoff race and starts playing their young guys…Too little, too late for Alan Anderson, whose value is done now that Paul Pierce is back. Thanks for nothing. Deron Williams returned in this same game and was tremendous, effectively ending the anticlimactic Shaun Livingston experiment…Checking up on two former Pickups, John Henson (58% owned) and Brandon Knight (59%) now seem to be the only Bucks with stable value. Let’s not discuss Zaza Pachulia…Look at the players who didn’t play for the Bulls (Jimmy Butler, Luol Deng, Joakim Noah, Derrick Rose), and you’ll know why Mike Dunleavy rocked it last night (24-5-3-0-2, 2 3pm). Just keep in mind that two games ago he finished a stretch where he scored under four points in four out of five games. The lack of offensive threats might also explain why Kirk Hinrich shanked all 10 of his shots. Tony Snell was better, but he’s still not worth owning…On a slower night, we need to have a serious discussion about the shifting values of Channing Frye, Markieff Morris, P.J. Tucker and Marcus Morris, who are all cannibalizing each other. Right now, I can’t even tell you who to trust…Wesley Johnson lost his starting spot to Jodie Meeks, and Robert Sacre recorded a DNP-CD, though his replacement Shawne Williams still didn’t do much. Meeks has been great lately, but it’s debatable who really has value here (aside from comedic value, in which case it’s definitely Swaggy P. Young) until we see a few more games with Kobe Bryant. Kirk Hinrich falls off this list with his latest awful performance and the rumor that the Bulls are interested in signing D.J. Augustin. Chicago is desperate to make something work at that position, and Hinrich is not the answer. Michael Carter-Williams will not play tonight. Again, I encourage playing Wroten until you see MCW forcibly yank him out of the line-up. 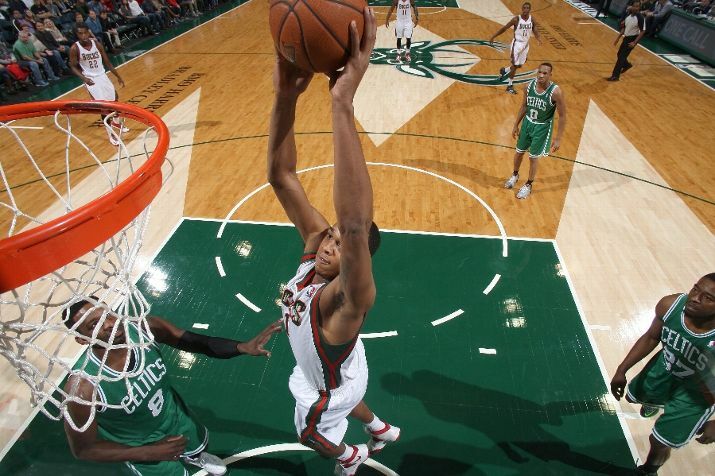 The Sneaky Fantasy Basketball Pickup for Saturday, November 30 is John Henson. He’s owned in 31% of Yahoo! Leagues and 40.1% of ESPN Leagues. If I’ve learned one thing this year, it’s don’t trust the Milwaukee Bucks. After watching both injuries and coach Larry Drew jerk around the fantasy values of Larry Sanders, O.J. Mayo, Ersan Ilyasova, Zaza Pachulia, Brandon Knight, Caron Butler, Khris Middleton, Gary Neal and Nate Wolters (remember them?? ), I recommended ignoring all Bucks players…except Henson. Henson, I said, was the only Buck with stable value. I was wrong. In his very next game, Henson played his fewest minutes of the year (15) and recorded a 5-5-2-0-1. Yet, here we are three days later, and Henson is the Pickup. Henson gets the Pickup due to one major change and one major constant. The change is that he started at center tonight for the first time in his career (he’d previously only started at PF). Coach Drew admitted Pachulia is still banged up from his summer foot surgery and finally gave the much more effective Henson the start. Henson did what you expect him to, which is rack up rebounds and blocks while giving you a little scoring. In many ways, he’s similar to the Bucks’ normal starting center, Larry Sanders, except for the part where Sanders put himself out of commission for six weeks by breaking his thumb while popping bottles over dudes’ heads in da club. That’s the major constant. John Henson has played all 16 games this year, making him and O.J. Mayo (who’s been awful) the only mainstays of Milwaukee’s rotation who have. While Henson may continue getting the start over Pachulia, keep mind that the Bucks also played this game without Butler and Ilyasova. Then of course there’s the looming specter of Sanders, who’s the rightful starting center despite not doing much with that opportunity in the games he did play this season. At this point, though, I think Henson has played well enough to merit a larger role even when everyone is healthy, but I also think we’ll never see everyone healthy on this team at any point this year. Is he legit? Last year, Henson was the rare per-minute stat phenom that superseded his ridiculous per-minute numbers when given the actual minutes. His per-36 projections were 16.5 pts, 12.9 reb and 1.8 blk. However, in his one game between 30-39 min, he played 31 min and posted 14 pts, 15 reb and 4 blk. It got even more ridiculous in his two games over 40 min, as in those he averaged 22.5 pts, 20.5 reb and 3.5 blk! These are the kind of numbers Wilt, Russell and Thurmond posted in the 1960’s when they were punking unathletic 6’8″ white guys! Henson’s per-36 numbers are more pedestrian this year, but you can expect some silly rebounding and block totals if he continues getting starter’s minutes. Whether he continues, though, is still up in the air. After all, you can’t trust the Milwaukee Bucks. Other Notable Pickups: One other quick note about the Bucks, Giannis Antetokounmpo (who I will start calling by his nickname Alphabet, even though I hate it, because his real name is too ridiculous) had his best game of his pro career (10-7-4, 2 3’s) in 28 min, while Khris Middleton fell off and both Caron Butler and Ersan Ilyasova sat. This won’t become commonplace for Alphabet (ugh) yet, but his upside is tremendous…Andrew Bynum is not any close to under 40% owned, but it’s worth noting that he posted his first 20-10 game since May 14, 2012 when he did it in the playoffs against Oklahoma City. Add the five blocks to his 20-10, and you’d have to go back to November 15, 2009 against the Aaron Brooks and Luis Scola-led Rockets to find another game like that. I can almost guarantee Bynum will see his minutes capped in his next game, but it’s fun to see a reminder of what he’s capable of when healthy and motivated, even against an elite defender like Joakim Noah…Two good games with heavy minutes in a row for Chicago’s new starting backcourt of Kirk Hinrich and Tony Snell. Hinrich has a higher upside because Jimmy Butler will return and kick Snell back to the bench, but, if Snell keeps this up, he’ll have played his way into coach Tom Thibodeau’s trust…Of course, on the day both Kevin Garnett and Brook Lopez return to the line-up and just one day after Andray Blatche posted zero points in 10 min, Blatche drops a 21-8-1-1-1 in 24 min off the bench. Don’t buy into it. Including tonight’s game, Blatche is averaging 8-6-1 in nine games with both KG and Lopez…A more interesting development is Shaun Livingston losing his starting spot to Tyshawn Taylor. Livingston had the better night–though that’s not saying much–but this demotion was a long time coming after he posted seven straight subpar games since his 23-point breakout against Portland…Kosta Koufos had his finest game yet as a starter this year (10-11-2-2-3), and he should be owned and started in all formats even if Marc Gasol will be back sooner than expected. Interestingly, Ed Davis also started and posted a serviceable 10 and 8 as Zach Randolph sat with an ingrown toenail. It’s an ingrown toenail, though. Don’t pick up Davis…Instead of Shane Larkin, Gal Mekel got the start at PG for the injured Jose Calderon. Mekel did get seven assists but otherwise did nothing of note other than miss a bunch of shots…Patrick Beverley may never put up fantasy lines anywhere close to the best of Linsanity, but his 11-6-5-3-1 and 3 threes tonight were very versatile. Plus I clearly overestimated Aaron Brooks’s possible impact…He’s hidden in San Antonio’s deep rotation, but Marco Belinelli is averaging 13.4 pts, 2.6 reb, 2.2 ast and 2.8 3’s on 53.3% FG and 83.3% FT over his last five games. He’s averaging just under 23 min (did I mention San Antonio’s rotation is deep? ), but he’s producing…Final reminder to pick up Jared Sullinger, who posted a 21-14 tonight (though not much else other than a three and good FG%). He’s at 39% owned tonight, and we’ll probably have to stop talking about him tomorrow when he likely clears 40%…Okay, so everyone hang on to your Channing Frye stock, feel free to sell on Gerald Green if you need to (Eric Bledsoe is set to start the next game), and Markieff over Marcus Morris again, for now…Way too many people are still sleeping on Marvin Williams. He’s been excellent, is averaging 32 mpg and won’t be giving Enes Kanter his starting spot back any time soon. The Jazz as a team looked great tonight, as seven of the nine players who played scored 12+ points. You know who didn’t? Enes Kanter. This will be our last look at Jared Sullinger and Channing Frye for a while, as both are bound to blow over 40% by tomorrow after both had great games tonight. Sullinger just barely edges Frye out for that top spot because I’m still wary of what happens when Bledsoe rejoins Frye in the starting line-up and reclaims all his shots, but Frye’s fantasy upside is definitely higher. Meanwhile, Koufos’s strong game and Bass’s disappointing one tonight causes a switch in the bottom two. This, by the way, is the strongest Top Five we’ve ever had, and the ownership percentages back it up. Expect to see Henson and Bellineli join this group tomorrow night if no other notable players arise. Hindsight: In other don’t-follow-my-own-advice-about-the-Bucks news, I just dropped Derrick Williams for Brandon Knight in one league following Knight’s almost-but-not-really-that-close-to-a-triple-double line of 20-9-8-1-1 and three threes tonight. As I said before I soured on all Milwaukee players, the Bucks want Knight to be their PG of the future. He’ll play a lot.